Here’s the first one: I always thought the name “Bluetooth” was unusual, and I wondered how that name was decided on for the industry comprising short-range radio technology. Intel’s Jim Kardash suggested the name as a temporary placeholder until a permanent name was decided on, because King Harald Bluetooth united Scandinavia just as Intel, Ericsson, and Nokia planned to support connectivity and collaboration between their various industries. If you’re interested in how the Bluetooth logo was designed, it is the combination of the Younger Futhark runes for H and B. Here is a thought that has been applied in many facets of my life! In a mold-making class for lost-wax sculpture, an instructor at a foundry once told me, “Never cut toward anything you like.” I have thanked him in my mind more that once for those words. The last thought I want to share with you is a quote from A Shadow Away, the first book of my series, “Alex Cort Action Adventures.” Angel is a mysterious, magical young woman who joins adventurer Alex Cort, and eccentric archaeologist Andrew Seaton, to solve mysteries linked to ancient myths and legends. She shows Alex and Andrew how to use her own kind of magic in their lives. Angel had this thought to share: “Believe in yourself and what you want to accomplish. When your heart and your mind are in agreement, miracles happen.” I believe these words are true, and have proven it to myself more than once. Well, these ideas and thoughts have given me guidance and structure over the years. Each one means a lot to me and I wanted to share them with you, in the hope that perhaps one of them will strike a chord in your heart. I wish you happiness and success in all you do. If you’d like to comment or ask a question, please feel free to contact me at joan@joanklacy.com. I’d love to hear thoughts or ideas that have helped you in your life journey. 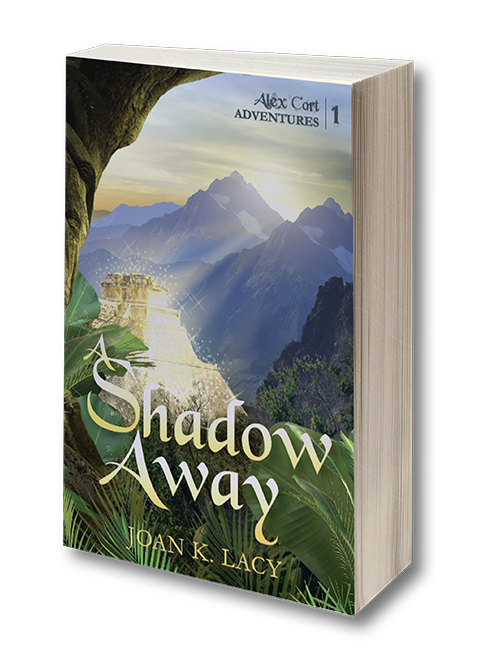 Sign up now and receive the first two chapters of my first book, A Shadow Away, for free!